OK, I'll be honest. 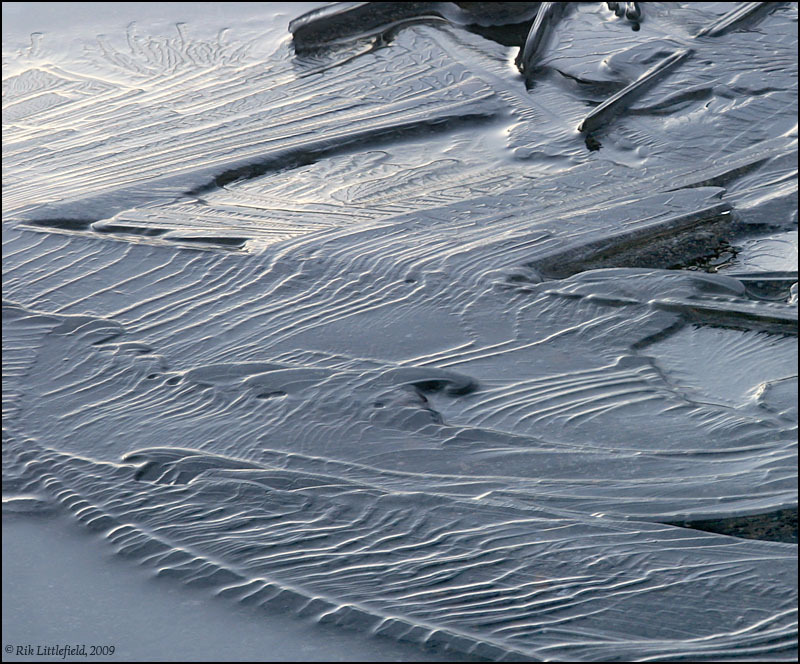 It's really not ice in a stream. It's ice in a street gutter. I just thought "stream" sounded more natural and wholesome. We've had quite a bit of snow and cold lately. More snow last night, but warm today so there was a lot of melting and we really did have streams in the gutters. But now the temperature is dropping again, and the streams are slowing down and freezing over. Apparently conditions are just right, because these large interesting crystals are all over the place. I thought you might enjoy seeing them. Technical: Canon 300D with Sigma 105 macro lens, ISO 200, 1/15 sec at f/11, stack of 22 frames. Subject width 4". Really feel for you there Rik. It is supposed to be 60 and sunny here tomorrow and that is in the mountains! Interesting image there by the way, haven't seen anything like that...well yet but I know its coming. 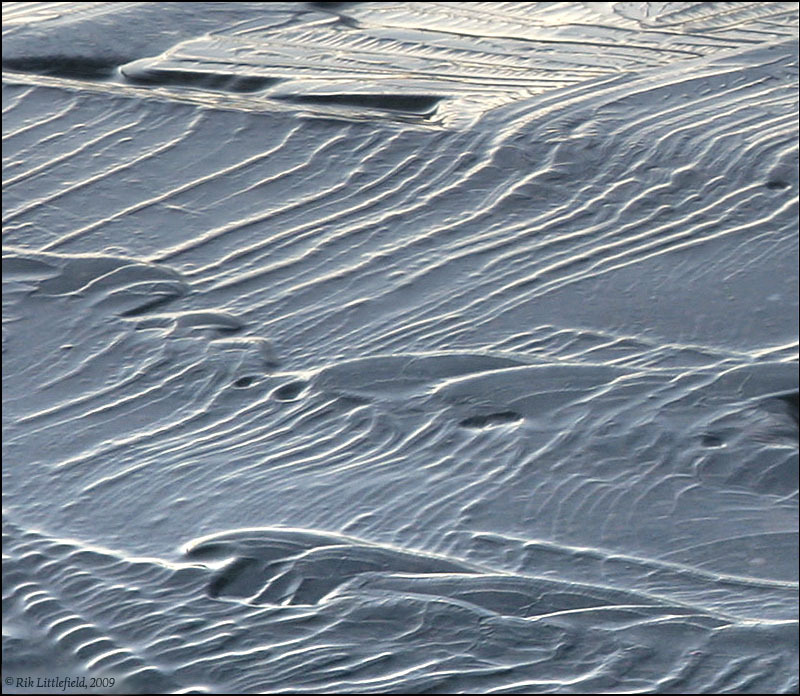 Here's a closer crop that shows more of the cool patterns in the ice. Somehow this strikes me as looking like something that should be coming back from one of our probes of some alien landscape. Ken, you've got 60 and sunny in the mountains? If that happened here, we'd make national news for the flooding! Now that you mention it, it maybe could pass for Europa or Io maybe? ...you've got 60 and sunny in the mountains? If that happened here, we'd make national news for the flooding! I bet you would! However, I've had enough bad news for one year. Lets hope for a much better one, eh? You know Rik that looks like a pic from an electron microscope! Come on,fess up,show us your new christmas present! 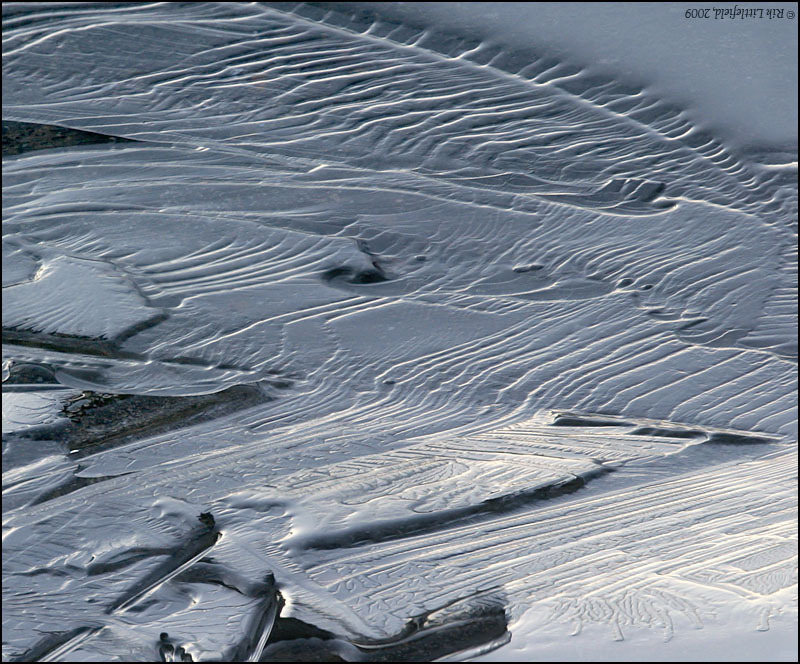 It does look like an SEM-scape, doesn't it? I've just finished reading a short article on the little rovers on Mars that just won't stop (gotta love 'em). If you rotate the first image 180 degrees - a type of optical illusion kicks in. Cute! It's completely plausible either way up, but the flip makes it seem a lot more 3-dimensional.